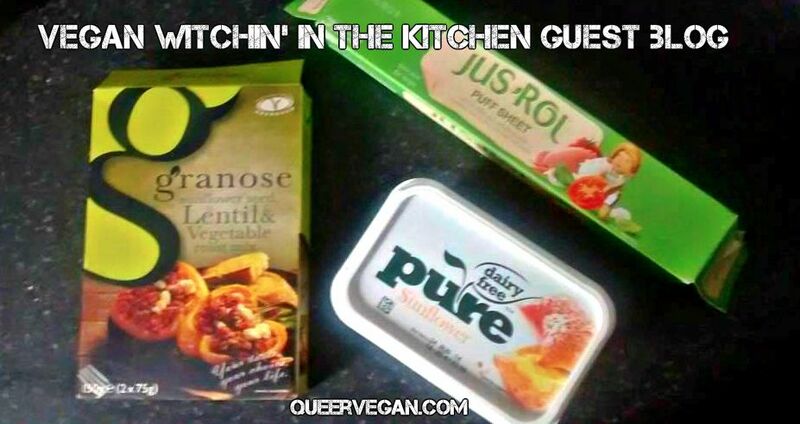 Vegan Witchin’ In The Kitchen is a bespoke food order service based in the UK. They also like to create cheap and simple recipes that anyone can follow. This is a guest blog by my friend Stephanie from VWITK called: The Savoury Plait! 1 pack JusRol chilled pre-rolled puff pastry. Some vegan marg to grease the baking sheet. Whilst mix is setting into a paste, open up puff pastry sheet & cut as per the picture below. Start folding in the pastry in a plait fashion on top of the savoury mix and trim any excess pastry at the end to make it look neater. Place on a greased baking sheet and bake for 20 minutes at 200°C or until golden brown. QV: Everyone I know is struggling for money at the moment. How much did this cost? VWITK: The whole lot cost around £3.20. So I guess that’s about £1.70 a portion because I didn’t use everything in one plait.